The 2 QSC speakers sit right on top of the front of the stage area (one of each side) were patrons sit for dinner then they move tables out of the way for dancing. The bottom of the cabinets sit about 2'ft above everyone head so placement is horrible and not even aimed correctly to begin with, but this rigging is completely horrible ad unsafe. Needless to say my wife and I didn't stay long but should I bring it to the owners attention at this point or just contact the local city inspector? This also might be a location that I might bring my own gear in for future events and will not use any of the existing system. Oh wow. That's is the best worst job post here in a while. Don't sit anywhere near it and don't use it. As has been said in another current thread, it's a bit dicey when, as a professional, one gives advice about overhead rigging. This definitely appears to be rigged haphazardly, but unless you are absolutely sure that this rig has not been certified by an installer or inspected by the local building code authorities it might be best if you just inform the place that this appears quite unsafe (rather than making a declaration of its safety) and, if you are so inclined, inform the local inspecting authority about the existence of this rigging. They can take it from there. What does the Waitress care? Find out from the manager who the owner is, and send him/her a note. A copy to the Fire Marshall would be a good move. That's an 87 lb speaker (QSC KW153) just begging to come down. The only way to be sure it will be dealt with effectively is to report it to an entity that can do something about it. There's no point in speaking to the owners as all you're doing is calling out it's you that reported it should inspectors come calling. If you're part of the scene, doing it anonymously also avoids dealing with backlash from the local music community (other venue owners, friends, bands). Although they should be thanking you, you can't predict how people will react. Even if you're not part of the scene I'd do it anonymously. You don't know the owners, how they'll react to laying out cash to do it properly and what fines they might be accessed, so don't risk retaliation. Well...at least it looks like they used the M10 rig points on the top...even if the rest is completely inadequate. If I was gigging there and needed the space under it I'd set it on the floor in the corner and leave a note warning any staff not to re hang it and make the owners do it right the second time. Who knows how it's really hung, and honestly it doesn't take much to hang 87 lbs completely static... I'd dine under it.. Regarding informing the fire marshal, I recently spoke to the fire marshal when he came in for a preshow inspection in a town I was working in. I have known him for years. I mentioned my concerns about some rigging practices of some very heavy set pieces and I mentioned that he might want to take a closer look at it. This is a very strict fire marshal and he said that doesn’t fall under his authority to do anything about. So depending on where you are this may not be a fire marshals job or concern. I was actually very surprised at his answer, to the point of not even then thinking to ask him whose job is it. You said “I don't get all the safety over-lording...” well It becomes a concern when there are incidents of people getting hurt or even killed due to improper rigging. So when we see things that we know are not proper rigging practices we have a tendency to be concerned for people’s safety. Are you saying that you don’t see the issues with the way that that speaker is hung when you say “Who knows how it's really hung,”? And as far as it being a “completely static” hang, do you think that the vibrations of the music being played thru that speaker have no effect at all on the hang? While technically most people would consider a hanging speaker to be static, there are vibrations at work. Have you any experience with vibration testing? It is interesting to see how things fall apart in some of these tests. Have you ever seen a speaker on the floor that doesn’t have rubber feet on it walk away from the sound being played thru it? 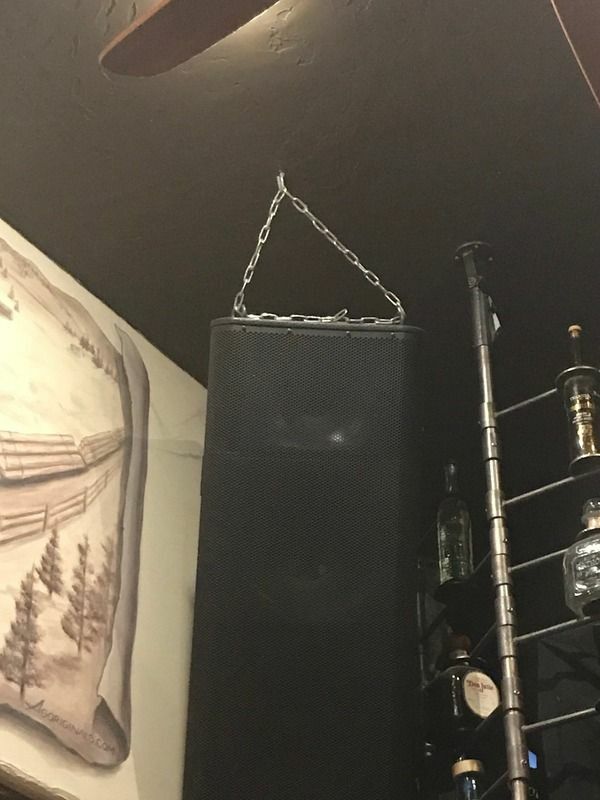 Is the speaker in the picture about to fall down? We don’t know. But we do know it isn’t hung properly. The thing that concerns me the most about it is the hook that looks like it is just screwed into the ceiling. It looks like a bent hook wood screw. So that right there is 2 things wrong. Here is a quote from a JBL document regarding hanging speakers.